LOS ANGELES, California (CNN) -- The cars drove up to the stadium in a steady, orderly stream Monday -- some drivers giddy with anticipation as they entered and shaking with excitement as they exited. 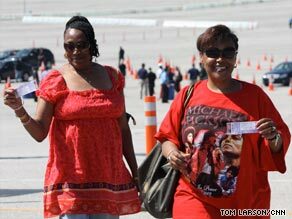 Tickets for the Michael Jackson memorial tribute were handed out on Monday in Los Angeles, California. By 10 a.m. 2,200 fans had come through Dodger Stadium in Los Angeles, California, to pick up tickets to the star-studded memorial service for pop icon Michael Jackson. Singers Mariah Carey, Usher and Stevie Wonder will be among the participants at the event, scheduled for 10 a.m. Tuesday at the Staples Center. Basketball stars Kobe Bryant and Magic Johnson and singers Jennifer Hudson, John Mayer and Smoky Robinson are also scheduled to participate, according to an announcement released on behalf of the Jackson family. The Rev. Al Sharpton and Martin Luther King III also will be there. Los Angeles police Capt. Bill Murphy said the distribution process was going smoothly. One person tried to pass off a photocopied voucher and was ejected, Murphy said. Sgt. Sandy Cline of the LAPD said winners drove to an initial security point, where their identification was verified, before they proceeded to pick up their tickets and wristbands. "It's been pretty steady and more of a dribble effect," Cline said. "Just a slow steady flow of cars." About 30 officers, as well as Dodger Stadium security, have been on hand. Authorities said they did not expect any tickets to go unclaimed, and extended the pickup deadline for the 8,750 fans -- who were chosen by random lottery to attend Jackson's Tuesday memorial service -- by one hour, until 7 p.m.
At the stadium, organizers gave each winner a pair of tickets and wristbands, one of which was placed on their wrist to prevent resales. "It's sparkly," said Alex Jugant, a student from Pasadena, California. "Michael would have liked that." Jugant walked for 30 minutes with his friend to get to the stadium after finding out he had won the tickets Monday morning. "He (Michael) wouldn't want us to cry," he said. "He would want us to dance." Tuesday, join CNN and CNN.com Live for all-day coverage as the world celebrates the life of a worldwide pop icon, and don't miss our prime-time coverage starting at 8 p.m. ET. Katy Rodriguez, who came with co-worker Vivian Short, said she was stunned to have won. "I was so surprised," she said. "Vivian is going to go and I'm going to give the other ticket to my sister." Allen Palos said he and his friends had planned to go to Europe to see Jackson on his comeback tour. Now, Palos said, he is consoling himself by being able to attend the memorial. "I had to read the e-mail two or three times to believe it, because I thought it was a joke," he said. "I feel blessed that I have a chance to participate in this." Each winner gets two tickets, bringing the number awarded in the lottery to 17,500. Just 11,000 of those are for seats inside the Staples Center. The other 6,500 are for viewing the memorial telecast across the street at the Nokia Theater. AEG Live, the promoter of Michael Jackson's London shows, owns and operates both venues. The Jackson family set aside 9,000 Staples Center seats for people they choose in addition to those who were awarded tickets by lottery, according to organizers. Debbie Rowe, Jackson's former wife and the mother of his two eldest children, will not attend, her attorney said Monday. Marta Almli said Rowe initially planned to attend, but "the onslaught of media attention has made it clear her attendance would be an unnecessary distraction to an event that should focus exclusively on Michael's legacy." For the service, organizers used a computer to choose the 8,750 names from 1.6 million who registered online during an 18-hour window. The winners began receiving e-mailed notification on Sunday. The e-mail gave them a secret code and instructions to appear at the stadium. "It was a breeze," Tommy Yune of Los Angeles said of his experience at Dodger Stadium. "I was expecting gridlock." iReport: Willy Wonka moment getting Jackson memorial tickets. Police have said no one will be allowed near the Staples Center without tickets or media credentials. The family decided to provide a free live video feed to networks so it would be televised everywhere. "Everything about the memorial has to do with accommodating as many fans as possible," said Ken Sunshine, a Jackson family spokesman. Even though organizers had said they would scrub entries to eliminate duplicates, it didn't stop many fans from registering multiple times. Billy Moses of Bellflower, California, said he used five different e-mail addresses. Four didn't make the lottery cut. CNN's Linda Hall and Lisa Respers France in Los Angeles, California, and Nicole Saidi and Henry Hanks in Atlanta, Georgia, contributed to this report.